French Culture Minsiter Francoise Nyssen claimed on Twitter Thursday that Belarusian writer Svetlana Alexievich, the winner of the Nobel Prize in Literature in 2015, has died. However, Alexievich herself told Sputnik the reports are false. MOSCOW (Sputnik) – Svetlana Alexievich was puzzled over the news of her death and said she's in Seoul presenting her new book. She said that she's alive and well. "I read the news and cannot figure out who made it up [the story of Alexievich's death] and why… I am in [South] Korea, in Seoul, at a presentation of my books in Korean," Svetlana Alexievich told Sputnik. "A terrible news. Svetlana Alexievich dies. No details," Nyssen, who is currently the French culture minister, and had previously been Alexievich's publisher, wrote on Twitter. A terrible news. Svetlana Alexievich dies. No details. — Françoise Nyssen (@NyssenCulture) 18 мая 2017 г. After the Tweet claiming of Alexievich's death had been released, another Tweet appeared which said that "This account is hoax created by Italian journalist Tommasso Debenedetti." Later in the day, the French Ministry of Culture told Sputnik it is investigating the matter surrounding Minister of Culture Franсoise Nyssen's fake Twitter account, which falsely announced the death of Belorusian writer Svetlana Alexievich earlier in the day. "The minister's chief of staff has been notified about the situation with the fake account. We are looking into it," the ministerial press service said. The ministry representative added that no further details on the matter were available at the moment. Svetlana Alexievich is a Belarusian investigative journalist and prose writer who writes in Russian. She received the Nobel Literature Prize in 2015 "for her polyphonic writings, a monument to suffering and courage in our time." 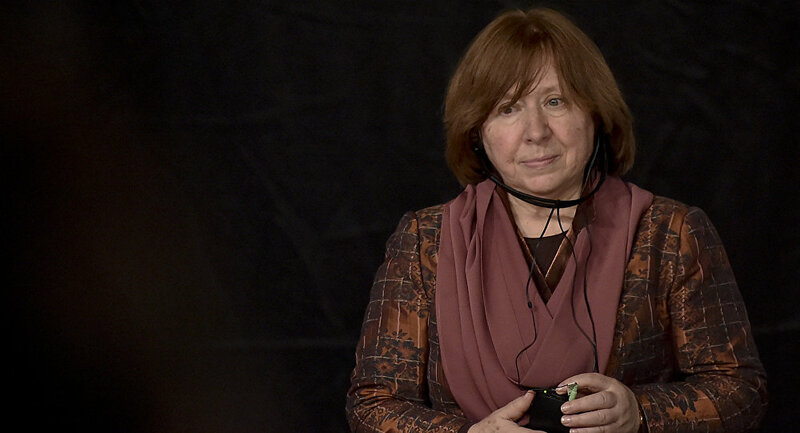 Alexievich has been known for works on World War II, the Chernobyl nuclear reactor accident and the consequences of the fall of the Soviet Union. Her works have been translated into many languages and she had been awarded nine times over the past two decades. This article has been updated to reflect that the claim of Svetlana Alexievich's death is false, as well as that the Twitter account of French Culture Minsiter Francoise Nyssen seems to be fake.